Taylor Swift appears to be a controversial figure on many axes; in terms of her music, her feminism, her very person. I think my Taylor Swift Position, were I forced to adopt one, is neutral; I like some of her music, I think she’s probably a perfectly nice person, and she’s made some very interesting and provocative public statements. I’ve also observed that she has worked extremely hard to become who she is today. 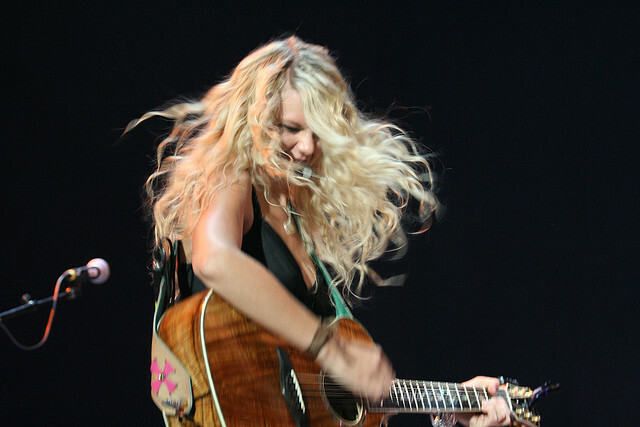 Taylor Swift, no matter how you feel about her, is very dedicated, focused, and determined. She decided she wanted to be a music star, and she became one. She writes her own songs. She is heavily involved in the development and production of her music. She takes a hands-on approach to her career instead of letting others manage it for her, and that’s unique for musicians of any gender, yet she’s rarely given credit for it in any circles. She often gets asked about feminism (she’s certainly declared herself as feminist) and she’s sometimes specifically questioned about how she can identify as feminist but sing about boys and other girly stuff. Her response often revolves around the fact that her primary demographic is teen girls, and that they are thinking of these issues, and that it’s important to acknowledge what her audiences are going through, rather than imposing her own thoughts and beliefs on them; she’s popular among teens because what she sings speaks to them, and she’d undoubtedly be less popular if it didn’t. Taylor Swift is a smart lady. She wants to sell records. But there’s something deeper here, too, that bears further examination, because sometimes these questions come from self-identified feminists, or those who claim to care about women’s issues, or people who seem to be concerned about women in media and pop culture. There’s a strange and bitter twist in the way they talk about her in her music, and talk to her when they have an opportunity to interview her. There’s an enduring myth that talking about boys or body image or femininity or being a girl is someone ‘antifeminist’ or letting the side down – if Swift is really a feminist, she should be singing anthems to hairy legs or advancing social justice in her music or taking on tough social issues. (Which she actually does, though rarely explicitly in her music.) Being a good feminist, which is what she must be if she wants to call herself one, apparently means bowing to the demands of people who have a very specific idea of what a feminist should look like. Swift ain’t it, because she talks about gross girl stuff. The thing is, though, that it’s incredibly sexist to talk about teenage girls this way, and to suggest that femininity doesn’t have a place in feminism, and shouldn’t have one. There’s a lot of hate for teens in media in general, and feminist spaces are no exception – and it’s notable that teens are often condemned for issues surrounding femininity and exploring who they are, however that might ultimately shake out. Swift is punished for speaking to people who are going through a specific life phase where they are thinking, hard, about issues that many of us have gone through, but seem to find abstract since they happened before, and this is now. Lots of teen girls are thinking about romance and love and relationships – sure, I’d love it if Swift queered her music, but she’s not here to cater to my needs. Lots of teens are thinking about what they look like and what they want to look like, and how society is judging them. Lots of them are also thinking about what they will encounter as they move through life and confront sexism, a world where they will be hit with a thousand cuts at every move. Swift is exploring all of that, laying it bare for teens to think about in a format that’s accessible to them. Which is actually pretty cool, if people would pay attention to it. She’s demanding that people value and pay attention to teen girls – she’s built a musical empire on a very carefully curated and controlled image that specifically centres teen girls. The fact that many people find that offensive, irritating, or somehow inappropriate is fascinating, and it says more about them than it does about Swift. Why are we expecting teens to be miniadults when they haven’t had a chance to go through a large number of important life experiences, including getting a chance to really think about who they want to be, free of the influences of their parents and tight judgmental social groups? Why are we demeaning teen girls by telling them that their worries about their appearance are invalid or vapid when we live in a world where appearance is everything – and a girl who frets about makeup can also be a political activist, can also be a reader, can also be a scientist or math-lover or anything else, really. In their haste to condemn Swift for not making the kind of music they want her to, many people should be asking themselves why it’s so important that we make teen girls feel uncomfortable for being who they are. How are teens supposed to mature if they can’t explore their identities? Swift’s music provides a medium for doing that; it might be a medium that many people think is safe and unchallenging, but it’s a starting medium. I for one would rather hear teens blaring Taylor Swift at a stoplight than be facing down demeaned, defeated, and depressed girls who feel worthless and useless because society has told them they have no value. In the garden: Where’s my rain?